Seventy-five years ago, the University like so much of the country became a victim of the bombing raids in the Second World War. The heaviest bombing in Cardiff fell between February and April 1941, with the University hit on the 26th February and 3rd March. 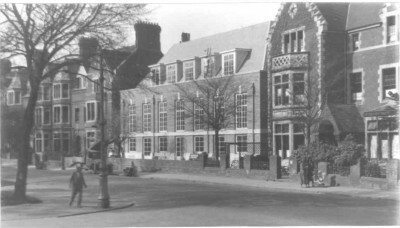 On the 26th February, bombs fell on the original Students’ Union building (pictured above – now the Student Support Centre), the gymnasium (now the Strength & Conditioning Centre) and the Tennis Courts (now the car park in Main Building). A large amount of Main Building’s windows were shattered or damaged, including the beautiful stained glass windows in the Science Library. Flying shrapnel and bomb casing left pock marks in the Portland stone around the door to the Park Place entrance of Main Building. 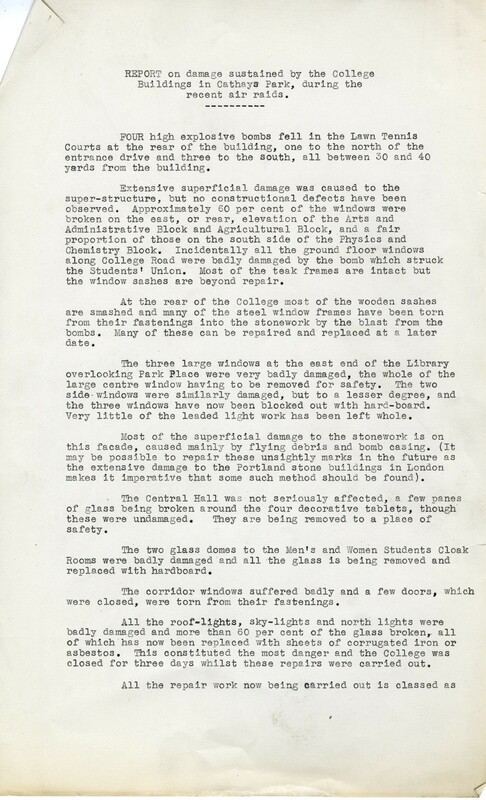 It was also on this night the Students’ Union received a direct hit which caused ‘very extensive’ damage to the Students’ Union Building, partially demolishing the newly built refectory. Walls and ceilings had fallen down and according to a report, breaking all of the windows. It is a painful irony that the Students’ Union building itself was conceived as a memorial to the students who were killed in the First World War. The building was repaired following the War and is now used by Student Support and Wellbeing. Tragically, this night also saw the death of a student firewatcher. After registering at the University just four months previously, Stephen Whitehouse was assisting with fire-watching responsibilities implemented by the University College. Stephen Whitehouse had turned nineteen just over a month before the incident. 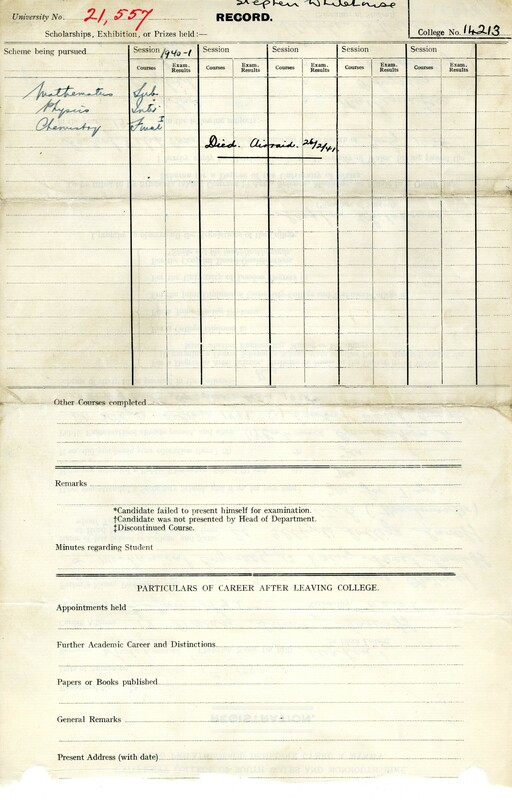 The Company Captain’s Report notes that he was seriously injured in the raid, but died of his wounds the following day in Cardiff Royal Infirmary. On the 3rd March, two bombs fell on Main Building – one through the roof of the Physics department and the other in the Drapers’ Library (now the Science Library). The incendiary device which fell in the Library caused a significant fire and the whole of Cathays Park was “studded with incendiaries”. A fire broke out in the Science Library and off duty students came and assisted. Without the bravery of these student and others who assisted, the fire would have gone out of control, and Main Building would not exist in the way we know it today. If you look around the entrance to Main Building from the car park, you can see pock marks caused by flying shrapnel, left as a testament to the impact of the War on the University. Wednesday – February 26th, 1941. The alert was received at 7.47.pm. The spotters rota went immediately into action – the two members of the Ministry of Supply staff took the first turn. Team Captain followed to the spotters roof about 8pm. Flares were seen to drop away to the S.E., more flares appeared shortly after at a point much nearer the College, and over the city; the action warning was sounded at 8.8.pm. Intense bombardment succeeded and continued until approximately 9.50.; incendiary bombs were seen to drop to the East, – none in the vicinity of the College. Large fires came to view; and high explosive bombs succeeded, some of which fell on the Students’ Union Building, the College Gymnasium, and in the East grounds of the College, causing casualties and damage. 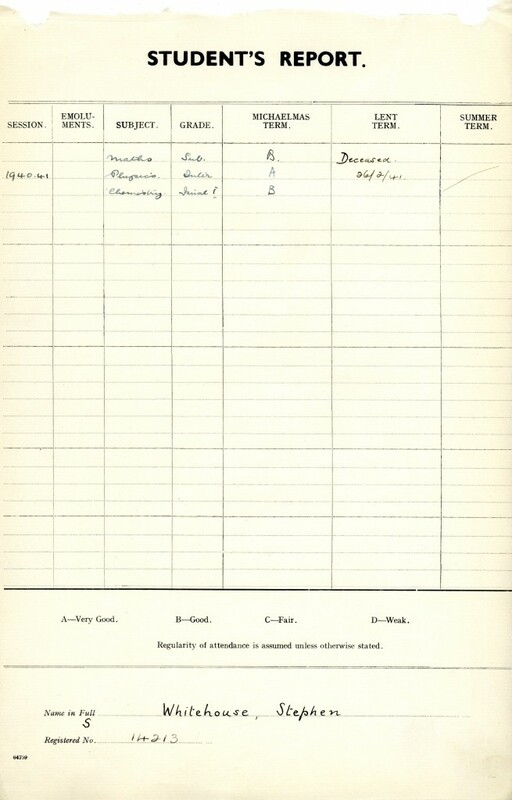 Those among the night fire patrol who received injury are Stephen Whitehouse (seriously), Dr. J. Heywood Thomas, Mr. Alun E. Alder, Mr. W. J. James, and Mr. J. K. Lloyd Williams, (the four last[nam]ed superficial cuts caused chiefly, it is thought, by flying glass and debris. Mr. Whitehouse received First Aid treatment and later was taken to the Cardiff Royal Infirmary; the others were all given First Aid treatment. The “Raiders Passed” signal was received at 10.pm. 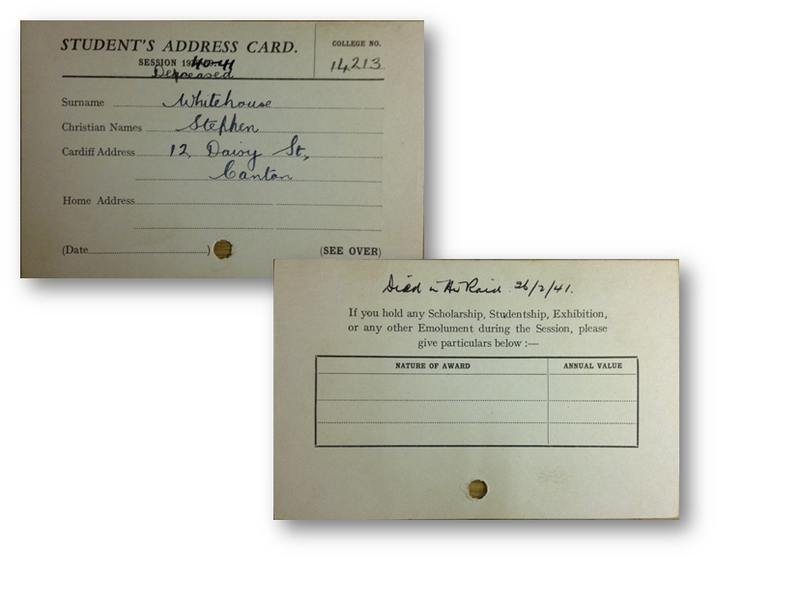 It is recorded with gratification that several members of staff and students reported to the College to see what help they could offer; among them was Mr. Gillison (Ministry of Supply). A survey of the premises was carried out after a roll call of all personnel had been taken. Four bomb-craters were discovered in the College grounds; a fifth high explosive struck the College buildings in Park Place causing extensive damage; as far as could be ascertained, in the circumstances, the damage to the College building itself consisted of numerous broken windows, skylights, doors, and window and door frames. 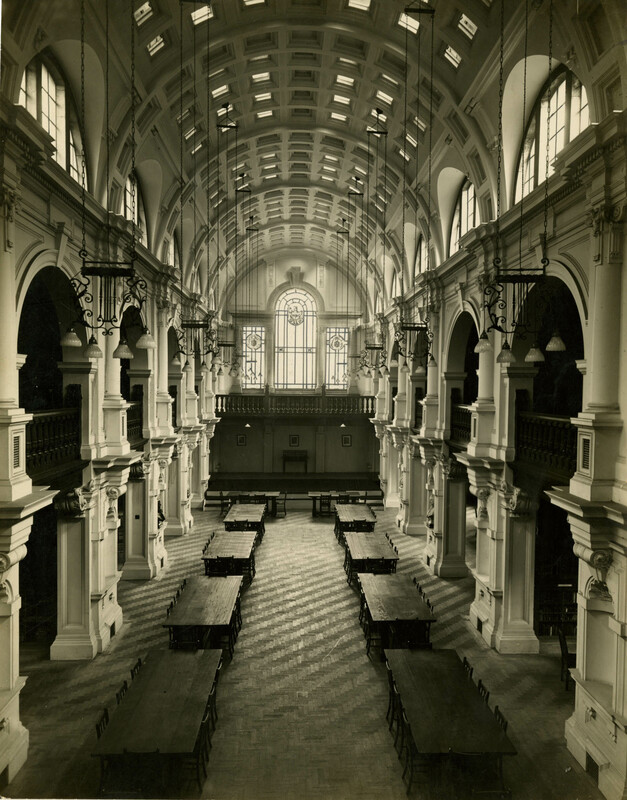 The Science Library (then the Drapers’ Library) suffered on both nights of the bombing. The bombing on the 26th February caused the beautiful stained glass window to be shattered. How do you think these compare with the replacements? 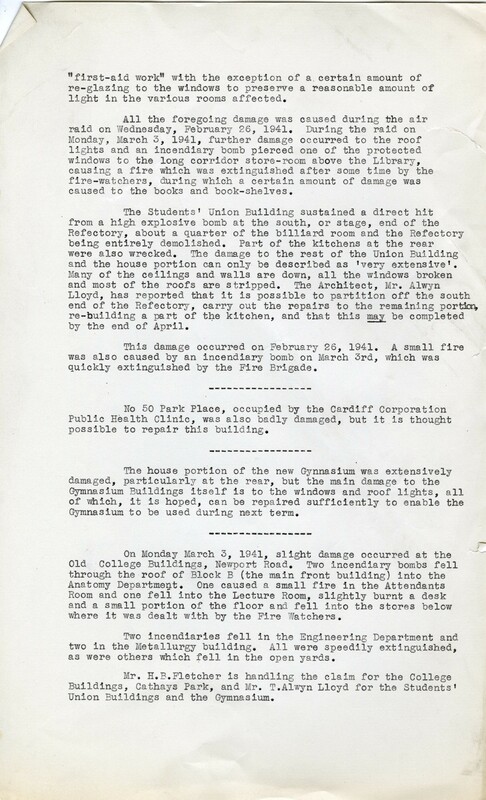 On the 3rd March, an incendiary device caused a fire in the library. Students who were passing by assisted with putting out the fire and saved the beautiful library from being completely destroyed. Can you imagine being willing to put your own life in danger to save the library? All except one+ of the party reported for duty: he was expected to arrive at 9.30, but at that time the raid was at its height. On the sounding of the town ‘alert’, the Ministry of Supply watchers went to the Physics roof: they sounded the alarm at once. , and This was followed almost immediately by a shower of incendiary bombs, which fell over the College and the surrounding area. One fell on the Physics roof and one fell through the Library roof, going straight down to the floor. These, together with several that were burning in the grounds, were safely extinguished. The whole of Cathays Park was studded with incendiaries, and some fires were started in the town. The incendiaries were followed by H. E. [High Explosive] bombs, and the gunfire was very heavy. At this period, a message arrived that the watchers at th the Gymnasium had safely put out several incendiaries, but were unable to control with stirrup pumps a blazing pile of wood, which had been stacked outside the Union. The bomb had lodged behind the wood & could not be reached. The messengers ran to the Police Station, and the fire was extinguished by the Brigade. The H. E. bombs were falling so thickly, after the first attack by incendiaries was over, that at 9.15 orders were given for the watchers to leave the upper floors: they were kept on the ground floor, in the positions of the main corridor which were most sheltered from falling or flying glass. Those who were without steel tin helmets were then ordered to Shelter 4, to be summoned from there if incendiaries should fall. 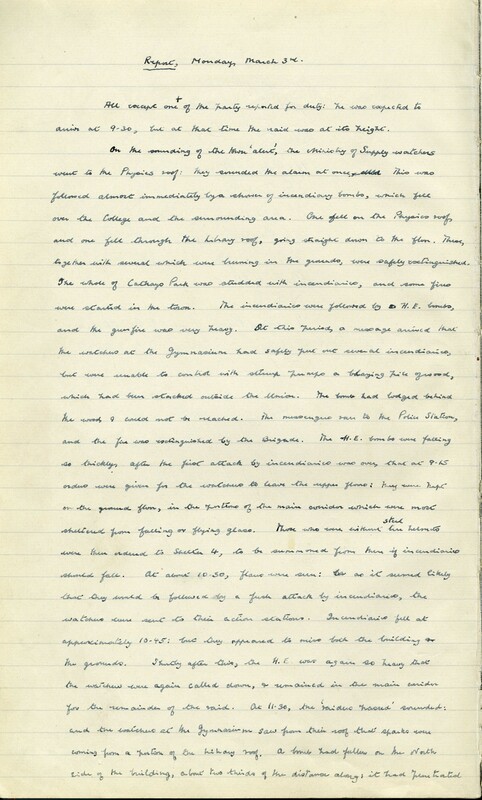 At about 10.30, flares were seen: A as it seemed likely that they would be followed by a fresh attach of incendiaries, the watchers were sent to their action stations. Incendiaries fell at approximately 10.45: but they appeared to miss the building or the grounds. Shortly after this, the H. H. was again so heavy that the watchers were again called down, & remained in the main corridor for the remainder of the raid. At 11.30, the ‘raiders passed’ sounded: and the watchers at the Gymnasium saw from their roof that sparks were coming from a portion of the Library roof. A bomb had fallen on the North side of the building, about two thirds of the distance along; it had penetrated the corrugated iron sheet covering the skylight; and as it had lodged in the top gallery, it had not been seen from the floor of the Library. The fire was tackled from inside the Library first; and then from the outside. The Police arrived on the scene after the fire had been fought for ten minutes: and several students who were out in the town came and lent assistance. Chains of buckets were formed both inside the Library & on the roof: in both cases, the links in the chain were of necessity somewhat widely spaced. The town ‘alert’ was sounded at the time of the arrival of the police: there was some gunfire, and some bombs appeared to be dropped; but only one was sufficiently close to cause the watchers any discomfort. The fire was extinguished in about an hour’s time. The remainder of the second alert was uneventful. The Police recommended before they left that ae pair of watchers should take care of the chance remnants of the fire, in case they should burst into flames afresh. This was done, an hourly rota of duties being arranged. Those watchers were also charged with the duty of collecting buckets, stirrup pumps & other equipment, filling the buckets with sand & water & placing them in readiness to meet a fresh attach. The damage to the Library could hardly be assessed at the time. It is to be feared that in addition to the damage by fire, these will prove to be a considerable number of books damaged by water. There would have been more if we had had the fire hydrants which the Police expected to find. There were no personal injuries. A certain amount of glass was broken in the College: this was mainly, as far as could be ascertained, fragments shaken from panes previously broken. It should be noted that it was discussed before the raid that the Library doors were locked: and that some inner doors of the Library were also locked. The nozzle became detached from one stirrup pump: & two pumps broke. As soon as it was light, the grounds were searched for unexploded bombs. Geoffrey Percival. . Team Captain. 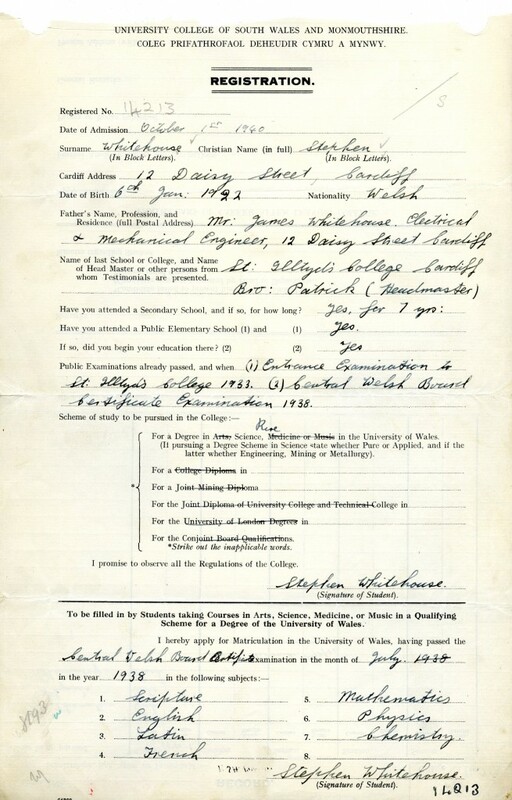 Stephen Whitehouse enrolled as a student on 1st October 1940 to study science. He was from a Cardiff family: his father was a mechanical and electrical engineer. 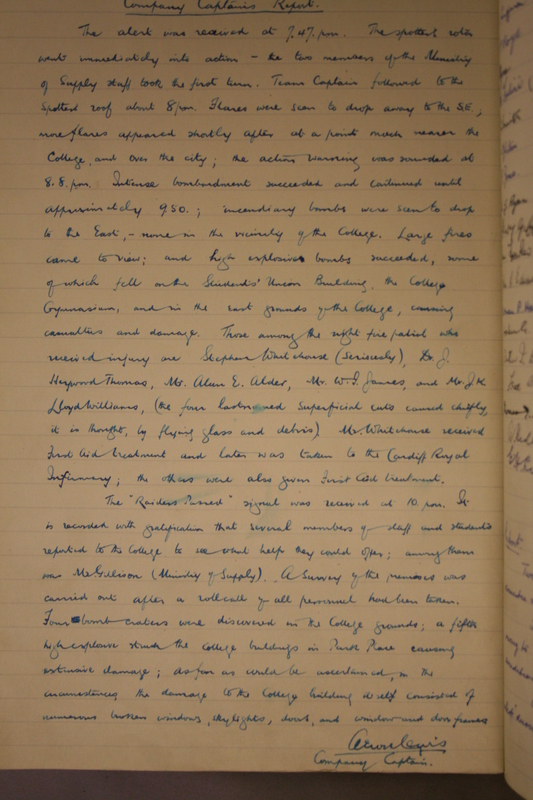 He became a student firewatcher, volunteering his services to help the University during the war. Firewatchers were given the responsibility of watching a certain area or building. They watched for incendiary bombs and communicated news of any fires. They could deal with incendiary bombs by dousing them in buckets of sand, water or by smothering. Just four months after enrolling, the University was badly hit and Stephen was seriously injured while on duty. He was given First Aid on the scene and taken to Cardiff Royal Infirmary after the raid had passed. As the age of 19, Stephen died as a result of the injuries he sustained while defending the University from enemy action. Stephen was the brother of Father Bernard Whitehouse, the late administrator of Cardiff Metropolitan Cathedral of St. David, Cardiff’s Catholic Cathedral. His obituary states that he was inspired to became a priest as a result of his brother’s tragic death (South Wales Echo, April 24th 2002). One of his final duties as priest was to unveil the plaque to Stephen Whitehouse in the University’s Catholic Chaplaincy. I visited the University today to take some photographs of the War Memorials outside the Science Library, and noticed the wreath laid in memory of Stephen Whitehouse. On looking him up on the CWGC web site, I saw how he died and what he’d been doing before his death. The only thing that’s missing is the actual location of his grave. All it says is that the “Reporting Authority” was Cardiff County Borough, Wales, but it doesn’t say in which cemetery he’s buried. Do you know where he is buried, please? I’m asking for my own information, but I hope that you can help. Thank you. Hi Phillip, Many thanks for your comment and apologies for the delay in getting back to you. I’m afraid we haven’t been able to trace the location of Stephen Whitehouse’s grave. 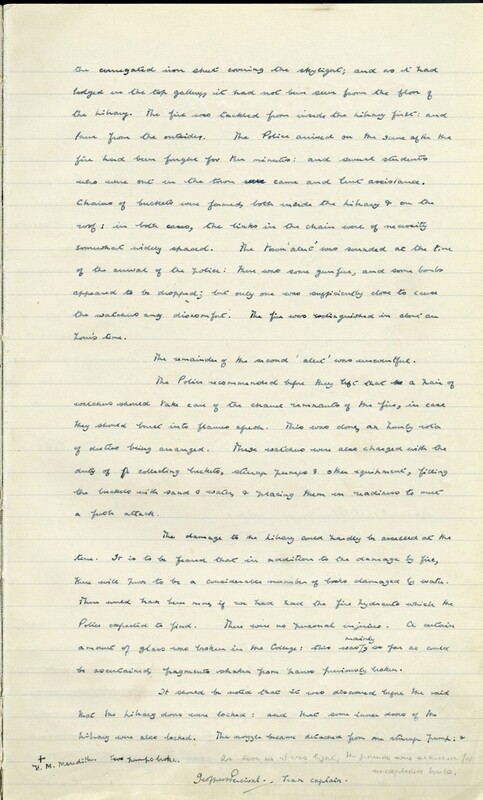 It may be worth contacting Glamorgan Archives (glamro@cardiff.gov.uk) to see if they have a record of it.